The skies have been quiet this past week. Only once did I hear an osprey. Remember how noisy it was not over a month ago when the osprey were abundant? Our area osprey have mostly migrated now. I miss their callings but know they will be back next March and another season of osprey will abound. 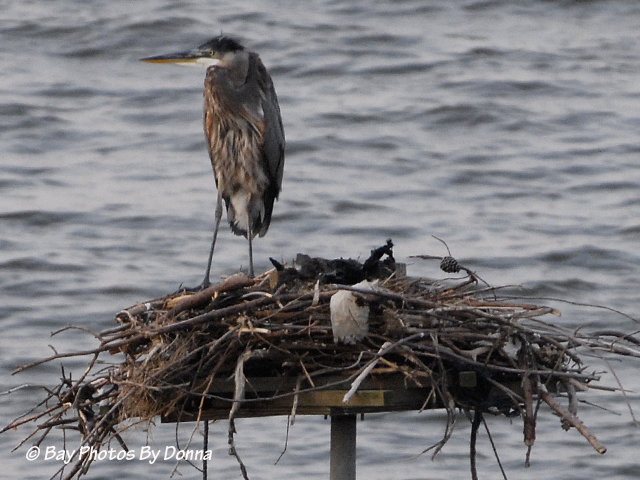 Now that the osprey aren’t around to protect their homes, both a Great Blue Heron and a green heron are visiting the nest and the surrounding waters daily. They don’t hesitate to perch on the osprey nest, checking the area out and the waters below….looking for the movement and flicker of dinner. 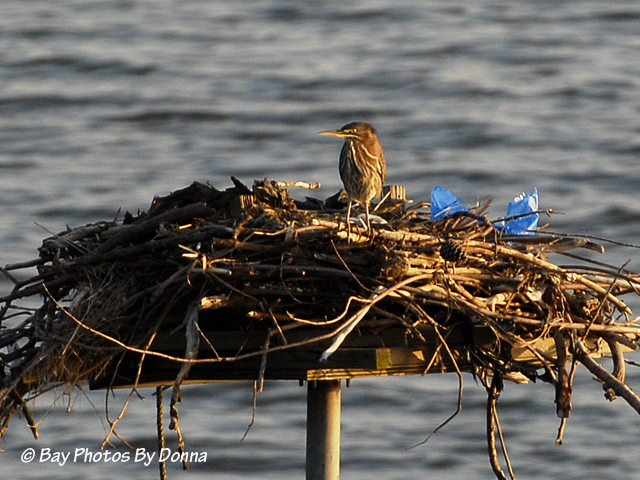 The green heron is the smaller of the two, usually growing no taller than 17 inches. 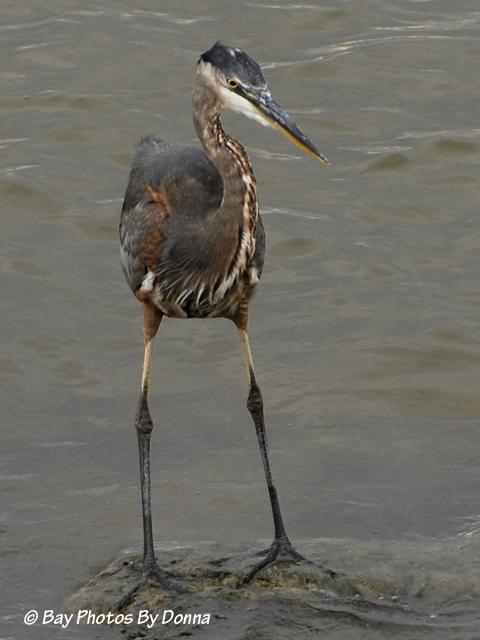 Whereas the Great Blue Heron will reach 36-55 inches tall. 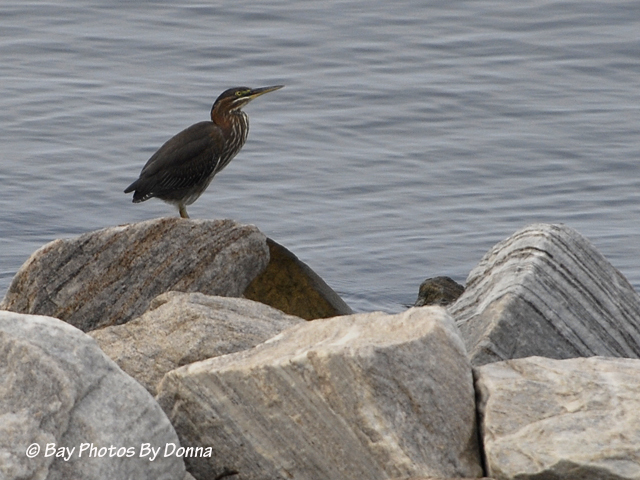 First a few photos of our visiting green heron. 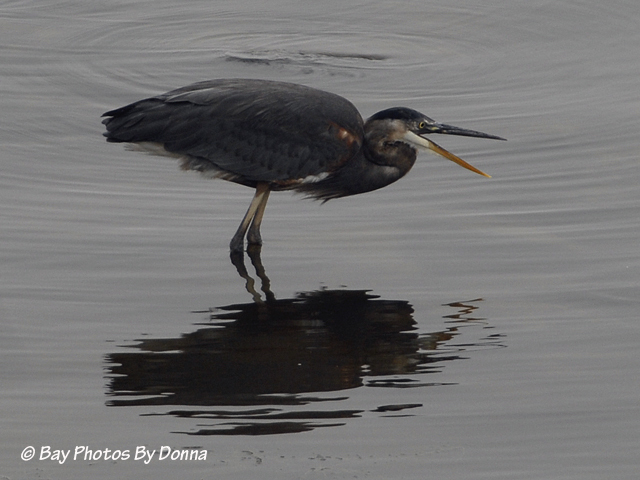 There were times when both the green heron and Great Blue Heron were visiting at the same time. They didn’t seem to mind the other there. The green heron would visit and move on, returning and leaving again. 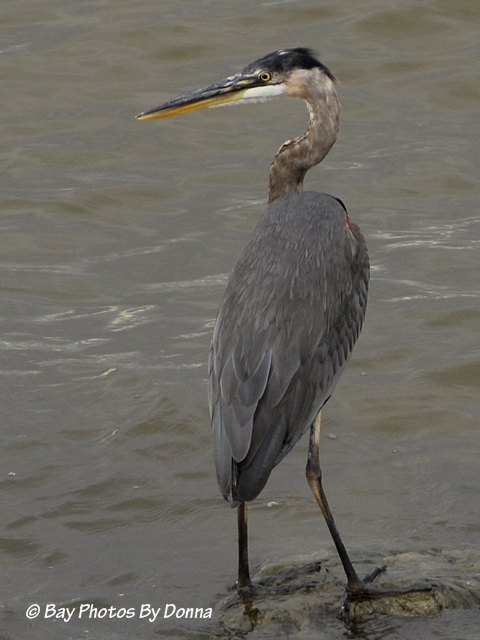 But the visiting Great Blue Heron appeared to be hanging at Oyster Cove most of the day each day. I found him there at sunrise, and there at sunset. On the weekend, I found him there throughout the day. He has been a joy to watch and photograph. 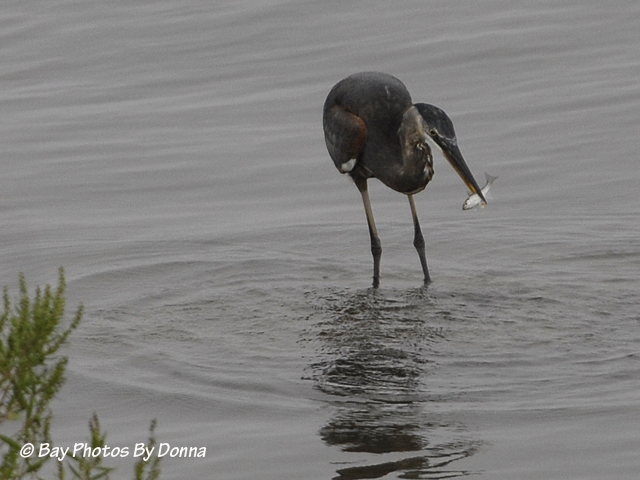 This fella was doing some awesome fishing at Oyster Cove, no wonder he kept returning every day. And his patience and striking pose were astounding. It would soon pay off as small fish would dart by for his strike. When he was finished ‘working that area’, he’d walk over to another area and assume his striking pose again. 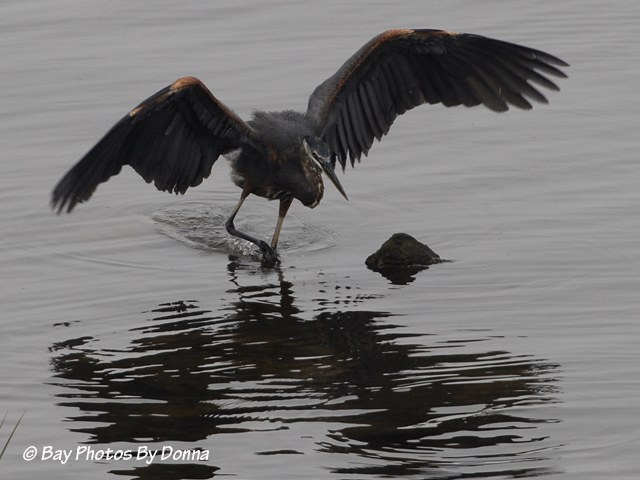 Sometimes if it’s awkward or slippery to ‘walk’, the blue heron will spread his wings for balance. 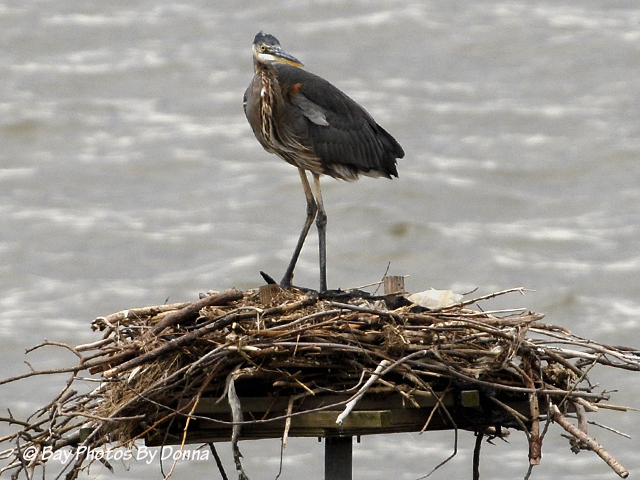 Yesterday, there were frequent walkers/joggers, and the blue heron moved around the base of the nest a lot, changing locations and positions. Which was awesome, once he repositioned off to the side of me on the berm, putting him a lot closer. I got some great close-ups of his beautiful coloring and stunning stature. 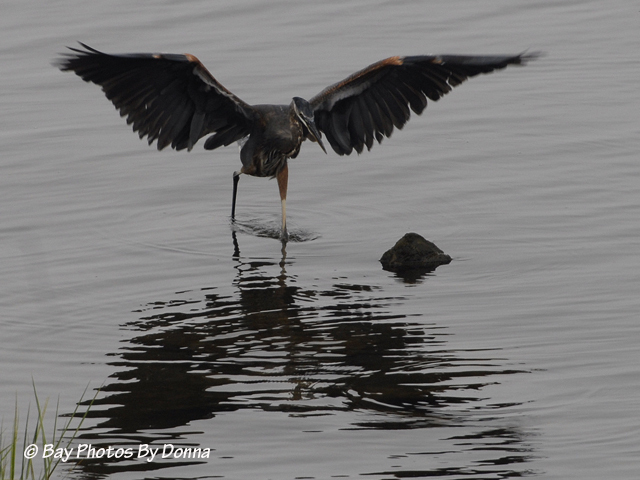 After that last shot, a walker came by and the blue heron took flight up to our osprey nest. When he felt safe enough, the blue heron returned back to the berm where he went back to his work, while I got a few more close-ups. Beautiful, isn’t he! He was at the nest again today, doing his thing! 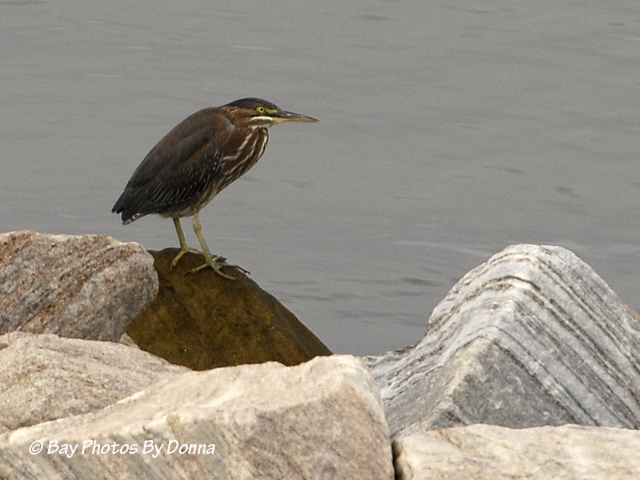 There’s a rock berm over at Mears Point Marina where there is usually some type of water bird(s) perched. 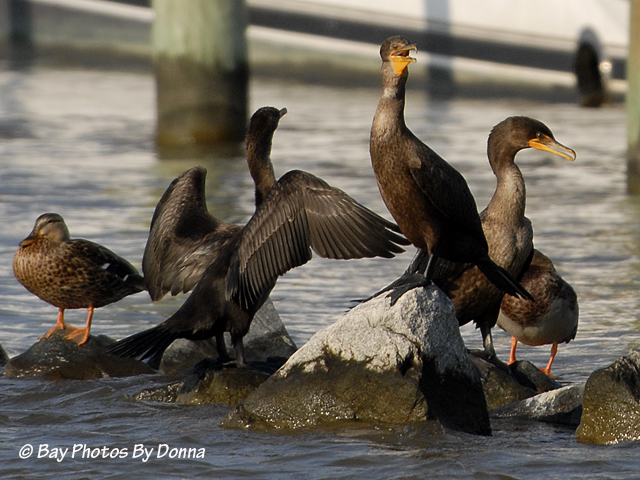 The sun was shining bright and I captured a shot of the cormorants who were hanging there along with a few mallards. For those in the community with binoculars, early each morning at sunrise there have been up to three eagles flying over CBEC, sometimes venturing close to us. 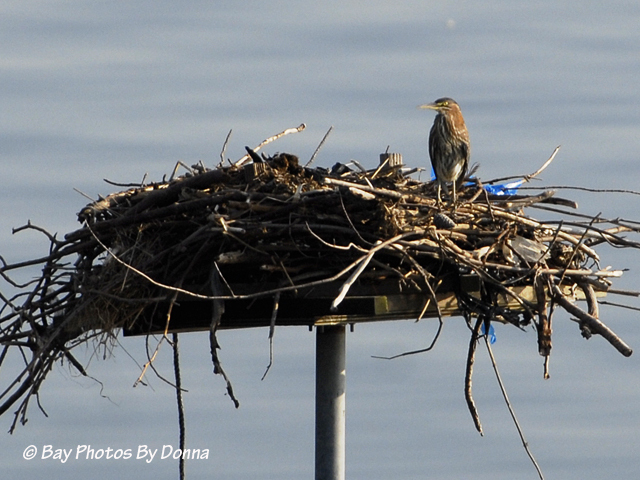 Their sightings will be more frequent as they begin their season of bonding, nest building, and mating in the area. Check them out as they gracefully glide through the skies. It’s just amazing, there is never a dull moment with nature here in our area! My goodness – if I were there, I would NEVER get anything done! 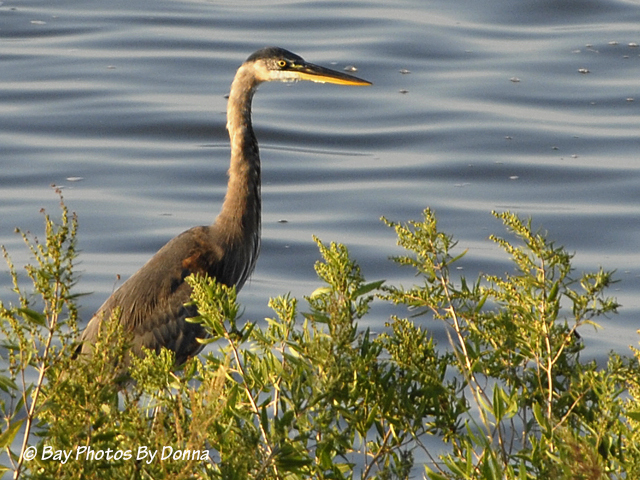 What an wonderful opportunity for you to hang out with the herons. And the photos are just great. 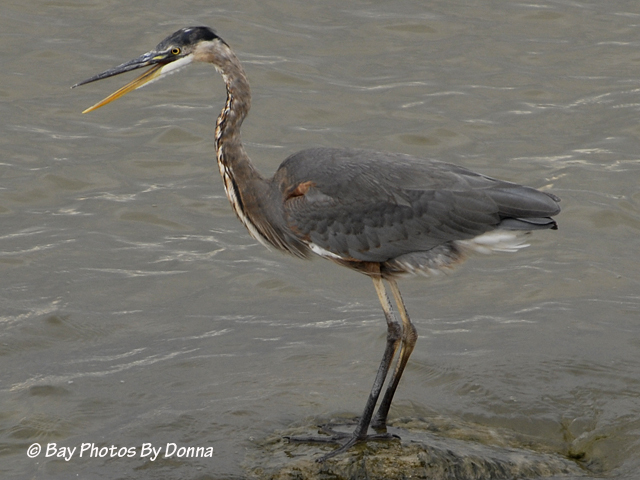 I really did enjoy seeing the close up of the blue heron. He is beautiful indeed. Thank you for sharing! I look forward to your posts and photos! All..absolutely beautiful…Thanks for sharing your pictures! 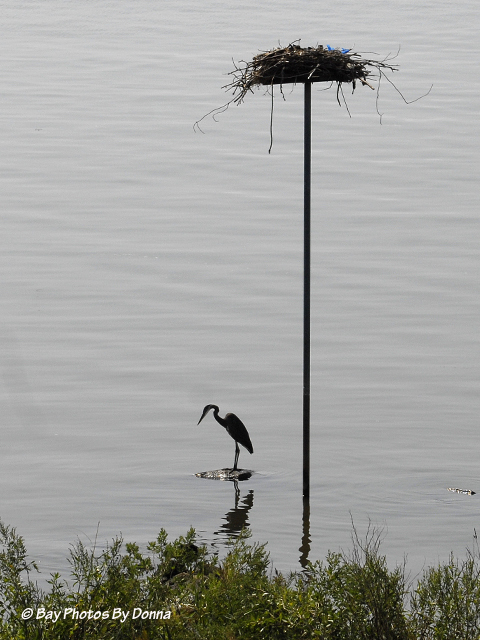 I love that long backlit shot of the blue heron below the osprey nest. And I’ve never noticed the rich pattern of white, brown, black, and russet (?) coloring on a blue heron’s neck and belly. Just wondering, how well do the cormorants seem to get along with mallards and others? Thanks Scott! 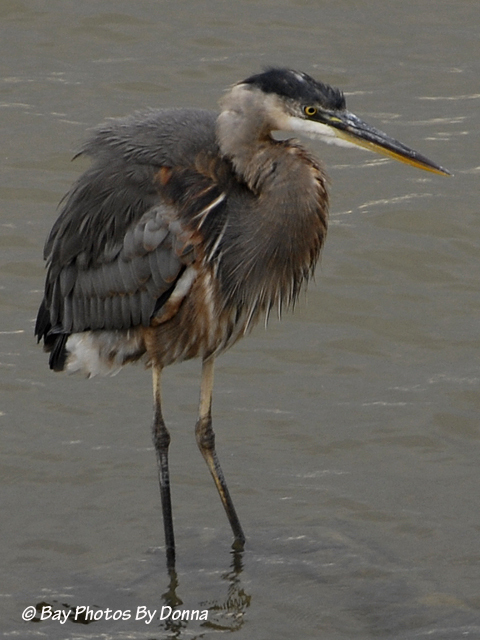 I’ve seen quite a few blue herons with that rich patterned coloring and had researched it before, thinking it was what they call a tri-colored heron. 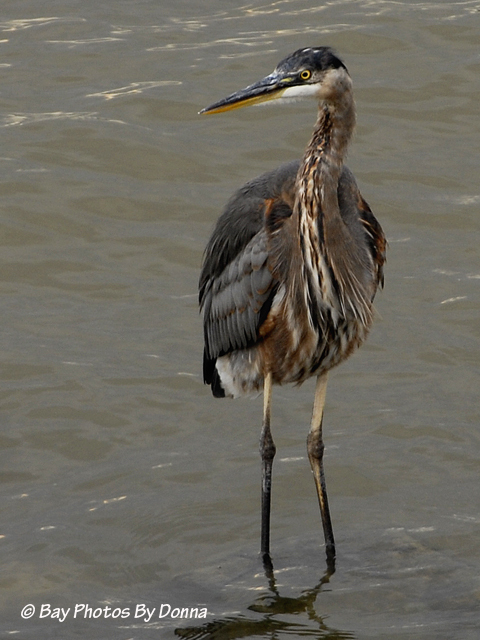 But the tri-colored heron is medium-sized, those I had photographed to ID have been 3-4 ft tall as the full grown blue heron. I remember reading their colors enhance during breeding season but that’s not until February. Maybe this one is early! He is a beaut! I’ve seen mallards and cormorants together a lot in our area on rocks and in the water and none ever showed any malice against the other. 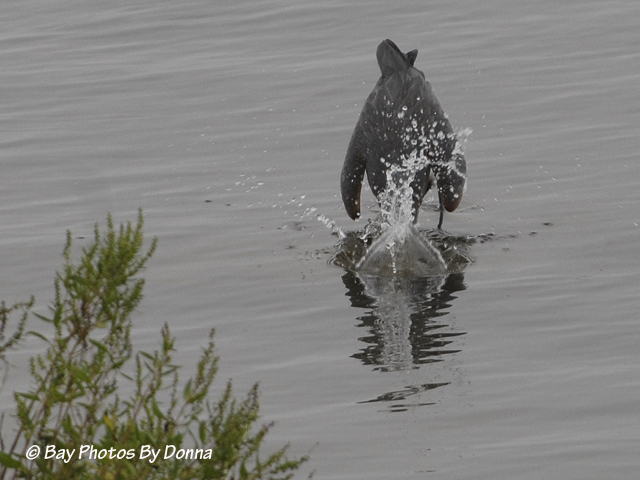 I had cropped the cormorants’ photo I posted, so I went back to see the full photo. There are a total of 9 mallards and 5 cormorants on that rock berm, all minding their own business, preening in the sunlight. One cormorant is even in the middle of 6 of the mallards. It’s nice to see nature getting along! Yes, good to see. Thanks for checking that out!